This class is for those seeking to obtain Del Oro High School World Language Credit as well as 4 units of Sierra College World Language Credit. (Possible Biliteracy Seal may be obtained on diploma). Here is where you will find videos and vocab lists as well as assignments and handouts. 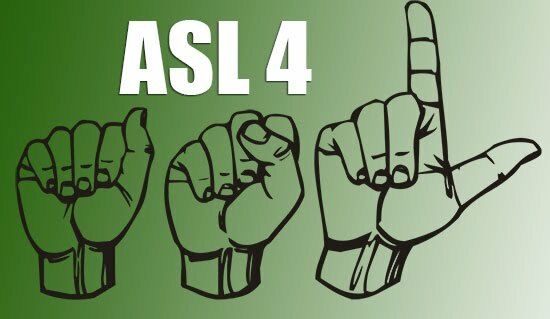 All worksheets handed out in class are available in the "ASL 4 Worksheets" folder below. Please review this website everyday to see what was missed in class. Tomorrow Dad Will Still Be Deaf (TDWSBD) Videos. You will be able to communicate effectively in the target language. You will be able to present ideas, essays, and speeches in correct ASL grammar. You will watch signed stories and poetry and then in groups will engage in dialogues in formal and informal settings along with completing written exams. You will write from English, to Gloss, and then be able to sign demonstration of knowledge of the above mentioned curriculum.